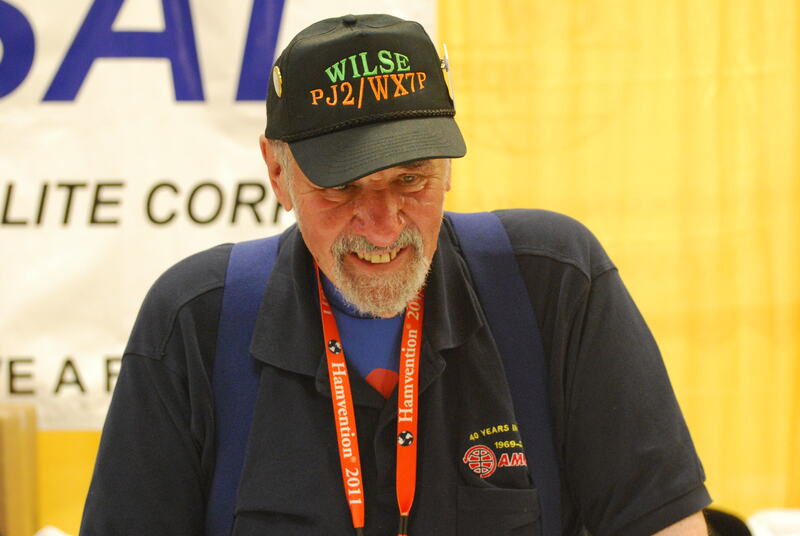 Wilse Morgan WX7P died from his long cancer fight on June 13, 2013. Wilse put Rice, WA on the map with his multioperator contest station where it was more important to train new contesters then to win the contests. A memorial celebration for the friends and family of Wilse Morgan WX7P was held at the Rice, WA Fire Station #12 Friday 6/21/2013. Great food was provided and many stories of Wilse’s exploits in amateur radio were made by his friends and family. 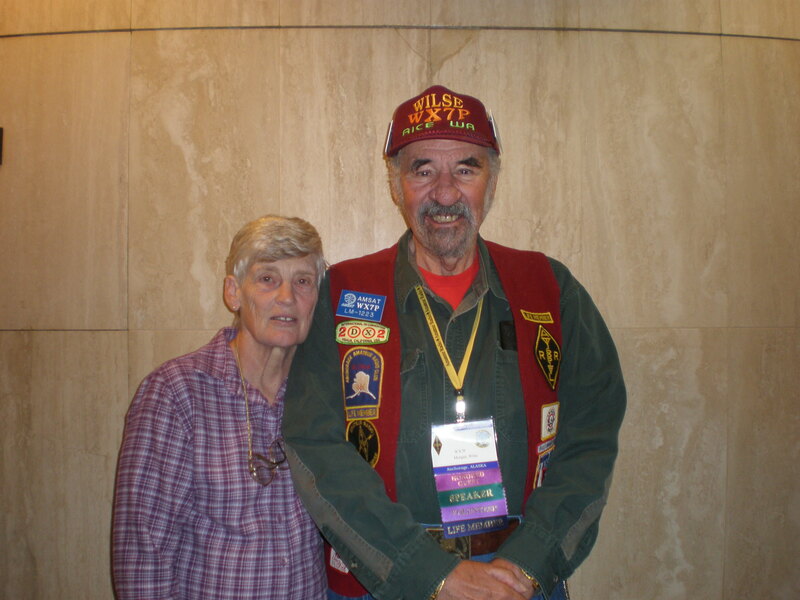 I last saw Wilse at Seapac, the convention in Seaside, OR on the weekend of June 1-2. At that convention, he could be seen busily checking QSL cards at the ARRL table. Also, he gave one of the 31 lectures to a packed audience on his famous 1000 foot beverage antenna on his property. Some of us in the SDXA saw this presentation a while back at our club meeting too. More details are pending. 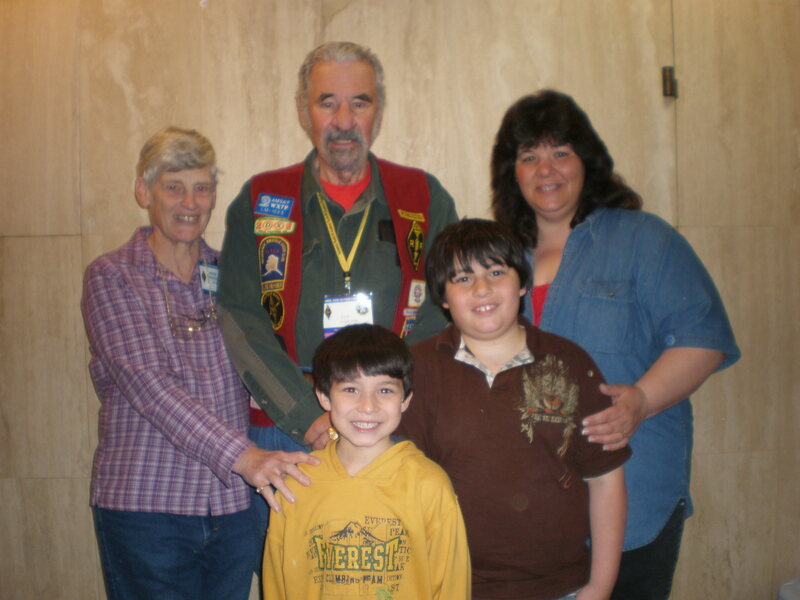 Wilse and Gimmie with Niece Anna Lee and her boys in Alaska at 2008 Ham conference in Anchorage. Wilse and Gimmie at the same conference. Wilse showing what an Alpha can do for you. In 1979, Wilse Morgan, KL7CQ wrote a letter on behalf of AARC to the FCC to become the first Volunteer Examiner in the country. 1983, He made a proposal to the FCC for the Volunteer Examiner program. Wilse was the first certified VE in the country, and on April 14, 1984 AARC was approved as the FIRST VEC COORDINATOR PROGRAM in the nation. In 1984, the Anchorage Amateur Radio Club through the leadership of Wilse Morgan, KL7CQ the Federal Communications Commission appointed the Anchorage Amateur Radio Club as its first volunteer examiner coordinator (VEC) in the United States. This program authorized December 1, 1983 allowed examinations for amateur radio operator licenses to be given by volunteer examiners drawn from the private sector. VE accredit volunteers administer the examinations and coordinate the entire program in a specific region. The Anchorage Amateur Radio Club was appointed the VEC for the State of Alaska, FCC Region 11. Today, the AARC VEC still plays an active role in the national NCVEC program through development of the Question pools used on the examinations and the AARC VEC continues to maintain the majority of the VE Examinations offered in Alaska. These programs are offered free of costs to all participating operators. The program has also been trying to prototype an online internet testing program to be available to remote Alaska. Below is the information on Wilse from his QRZ.com site. This site disappears as soon as the FCC database removes a particular call so I preserved it for us. PJ2/WX7P PJ2/WX7P PJ2/WX7P — I operated PJ2/WX7P from March 23rd till March 29 2011. Wilse, WX7P, was first licensed in 1952 at the age of 20, sporting his Novice ticket call of WN6PVF. He entered the Navy and served during the Korean War. 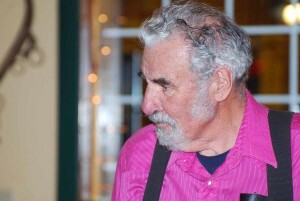 When discharged in September of 1954, he made use of the GI Bill and completed a five year course in math and electronics at Cal Poly in San Luis Obispo, known today as the California Polytechnic State University (http://www.calpoly.edu/ ), receiving a BS degree 1959. Following his university studies, Wilse went to work for the FAA as an electronics tech in Grand Junction, CO. His first project involved checking the sensitivity of UHF receivers and power output of UHF transmitters and driving a snow cat on the Grand Mesa just above Grand Junction (http://www.grandmesabyway.org/ ). After two years of special training at the FAA academy in Oklahoma City (http://www.faa.gov/about/office_org/headquarters_offices/arc/programs/academy ) in communications, air navigational aids, and radar, he transferred to the FAA office in Seattle where he found himself still doing field work and inspections of FAA facilities. In 1964, seeking new challenges, he left the employment of the FAA to make printed circuit boards in his basement. By 1969, he sold out his interest in the business which had 92 employees at the time and, once again, seeking greater adventures, went to Alaska in October of 1969, on a fishing trip and finally came back 20 years later. Once in Alaska, he worked for Federal Electric on the White Alice Communications System (http://www.whitealice.com ), the communications system that linked the radar networks that watched Russia such as the Distant Early Warning Line (DEW Line) and the Ballistic Missile Early Warning System (BEMEWS) to control facilities. Subsequently, Wilse worked in the Air Force as an electronics engineer. He also served as a LT COL in the Civil Air Patrol (CAP) (http://www.cap.gov/ ) and served in Search and Rescue on the Wing Commander staff as Chief of Communications for the State of Alaska. True to form as an amateur radio operator, he had the opportunity to experience slow rolls in an Air Force jet over Mt. McKinley while working two two-meter repeaters, one in Anchorage and another in Fairbanks, at the same time.good ole Wilse, always the ham. By this time, Wilse had acquired the Alaskan call of KL7CQ with two 90 foot towers and two 60 foot towers with Telrex beams in the Rabbitt Creek region near Anchorage. He was quickly working the very first satellites as well as doing lots of DX contesting. 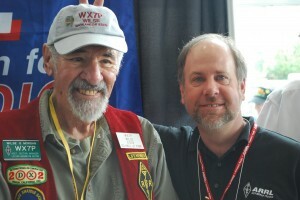 As a member of the Anchorage Amateur Radio Club (http://www.kl7aa.net/ ), he served in different positions for 18 years and also became the number 1 life member of the club. KL7CQ left Alaska on October 4, 1989 but not before installing a large beam antenna with a hot air balloon and subsequently the same project with a helicopter. Both of these projects ended up being featured on the cover of CQ Magazine for September 1980 (http://hamcall.net/cqcgi/?res=l&yr=1980&mo=09&pg=001 ) and August 1984 (http://hamcall.net/cqcgi/?res=l&yr=1984&mo=08&pg=001 ). During his 20 year tenure in Alaska, he taught courses in ham radio at University of Alaska (http://www.alaska.edu/ ) and the Anchorage Community College for 13 years, graduating over 800 licensed hams. He was involved with the very first VEC exam in the nation and was the first VE and the only one ever certified by the local FCC office in Anchorage. All other VEs subsequently were certified by volunteer examiner boards. Roger Hansen, KL7HFQ, was the Chairman of the VEC committee. Roger, Wilse, and YL KL7KL, Margaret Ogren, administered the first exam ever given in the US on April 17, 1984. 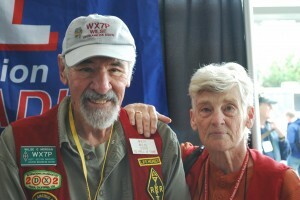 Richard Dennis, KL7IOL, was the first amateur to pass a VE exam in the nation. 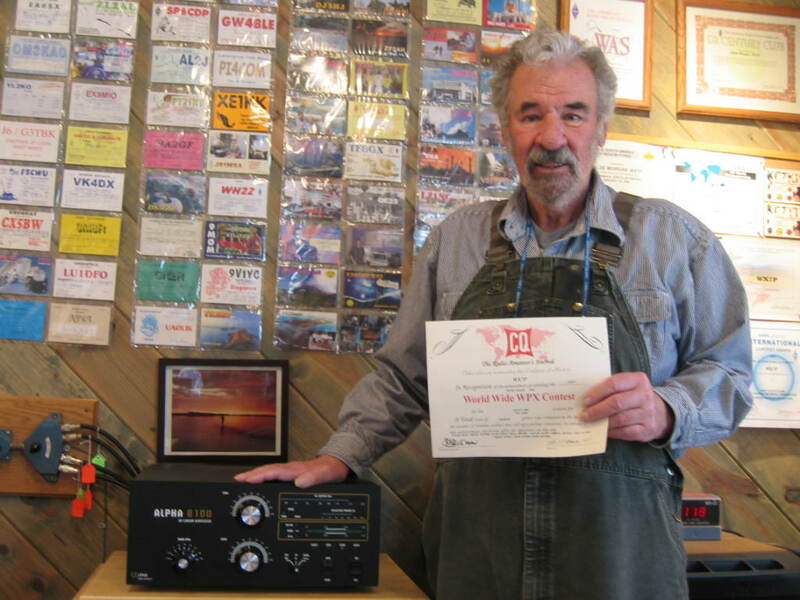 Also while in Alaska, Wilse became recognized by the ARRL for assisting through amateur radio with saving the lives of 9 souls aboard an airplane that crashed into Lake Minchumina in 1978. He received national recognition in QST and was the recipient of a nice plaque for display in his shack. Currently Wilse, now WX7P, resides on 21 acres in Rice, WA overlooking the Columbia River with a relatively substantial antenna farm. He is very active on satellites, PSK31, DXing and contesting. Nowadays, there are three towers, a 13 element log periodic, a 40 meter 4-square array, a Hy-Tower vertical, full size inverted Vs on 160, 80, 40 meters, and dual yagis for satellite work on an az-el rotator. Look for him on the air but likely you will find him in a contest. 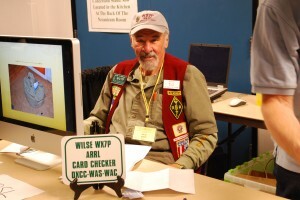 Wilse is a Life Member of the Panoramaland Amateur Radio Club in Colville, WA (http://www.qsl.net/k7jar ) where he recently completed his second term as president but still keeps members informed about the latest contest activities and DXing. Wilse is also a member of the Spokane DX Association (http://sdxa.org ). The latest recognition of his contagious enthusiasm for ham radio occurred as Wilse was entering the recent Dayton Hamvention (http://hamvention.org/) on May 15, 2009, when it was announced that he had been inducted into the 2009 CQ Amateur Radio Hall of Fame.